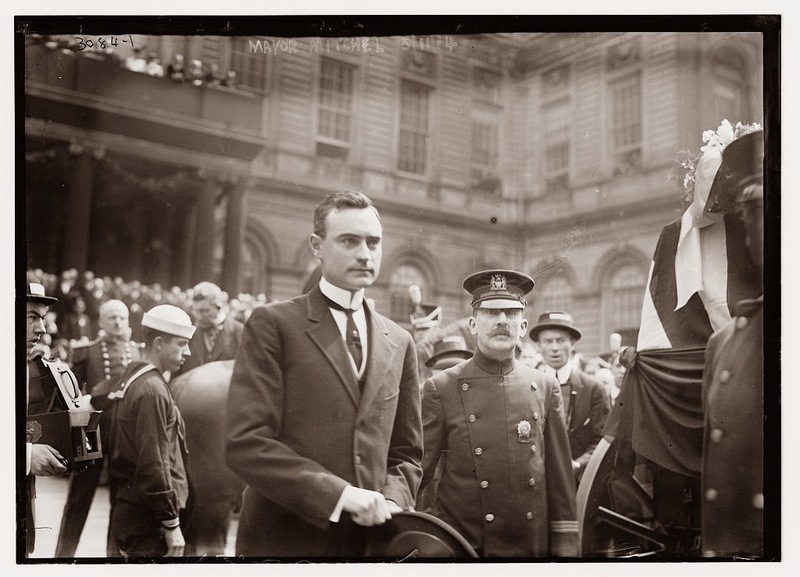 It was an pleasant early afternoon one hundred years ago today when Mayor John Purroy Mitchel boarded an automobile on Park Row carrying other members of his staff, including police commissioner Arthur H. Woods, tax commissioner George V. Mullan and corporation counsel Frank Polk. Suddenly, a man later identified as Michael P. Mahoney approached the vehicle, pulled out a revolver aimed at the mayor and pulled the trigger. Mahoney, described as “a wretched, despairing, mentally weak old man” and a bit of a “semi-lunatic,” was an unemployed blacksmith who blamed the mayor for a host of personal grievances. After drifting from city to city, he arrived hopeless in New York, living in a boarding house on East 50th Street. Later found in his room was a disturbing collection of rantings against a host of prominent citizens and organizations, most notably Andrew Carnegie. But on this particular day, he meant to off the mayor. Within his pocket were angry letters to the mayor, although I’m not sure when he intended to present these. 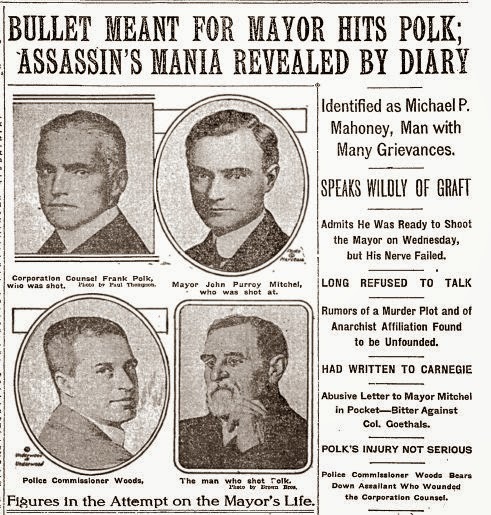 Mahoney’s bullet ended up whizzing by Woods and the mayor, hitting Polk through the chin, shattering the jawbone and instantly dislodging two teeth which flew from his mouth. “He got me! 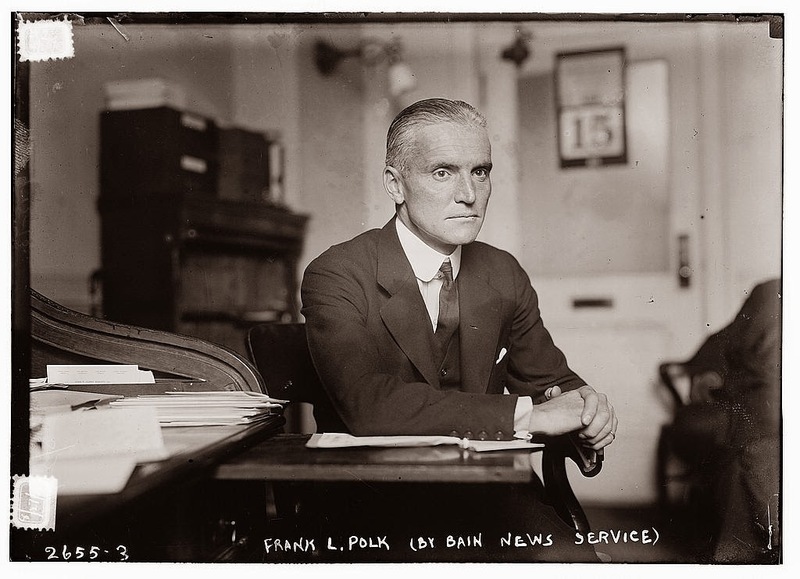 He shot me in the mouth,” Polk managed to scream. 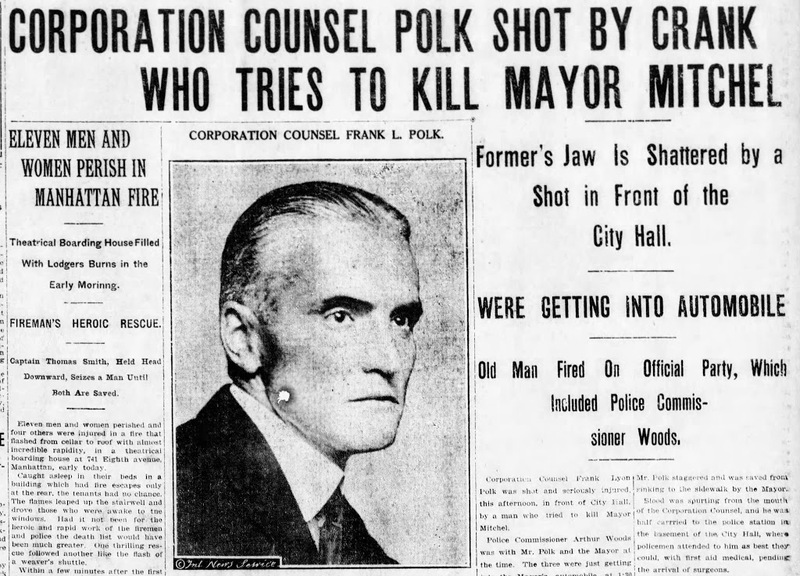 The mayor’s cheuffeur leapt to Woods’ aid, wrestling the gun from Mahoney’s hand. The mayor, meanwhile, was well equipped to defend himself; in his pocket he carried his own revolver. After all, the last mayor, William Jay Gaynor, had also been shot by a disgruntled constituent. “The experience of the last administration teaches us that there are always a few crazy people in every community and no one can foretell what they will do,” Mitchel said. Luckily, he did not need to use his weapon. Hundreds soon gathered around the car. While word inaccurately circulated that the mayor had been assassinated, others leaped upon the would-be murderer, a bizarre heap of bodies upon the sidewalk. Mitchel, Polk and the rest were then rushed to the basement of City Hall to assess the chaotic and bizarre situation. Mitchel’s chauffeur found Polk’s dislodged teeth and later returned them to Polk. He later joked that he would have the teeth mounted in gold. Although Polk would wear a slight facial scar for the rest of his life. it clearly didn’t hinder his career in any way. 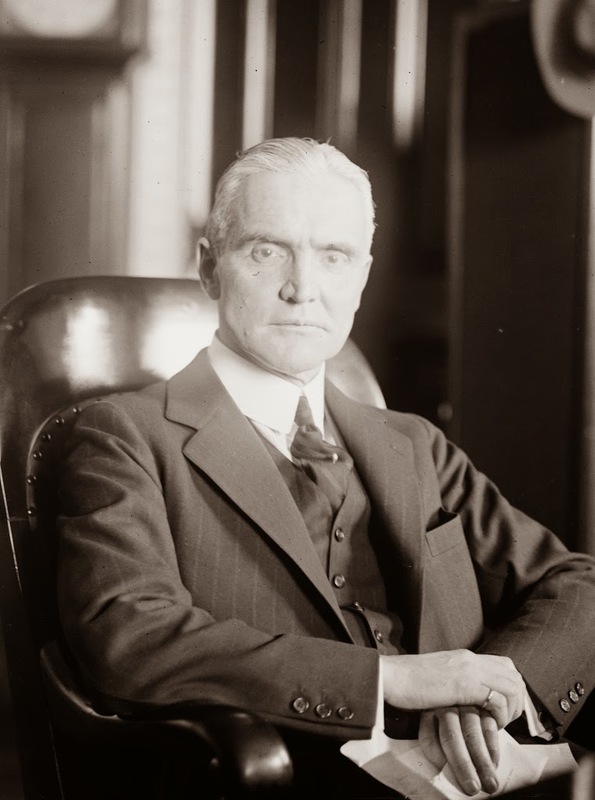 He was later Under Secretary of State of President Woodrow Wilson and started a prominent law firm Davis Polk & Wardwell which is still very much in business today. We talk about this frightening event in our podcast on the Boy Mayor of New York. This blog post has more pictures of Mayor Mitchel, and you can find the podcast here and on iTunes.